Do you live in Bradenton? Bradenton /ˈbreɪdəntən/ bray-den-ton is a city in Manatee County, Florida, United States. The U.S. Census Bureau estimated the city's 2012 population to be 50,672. 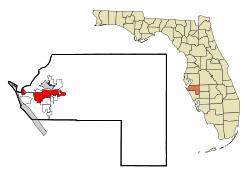 Bradenton is the largest principal city of the Bradenton-Sarasota-Venice, Florida Metropolitan Statistical Area, which had a 2007 estimated population of 682,833. It is the county seat.